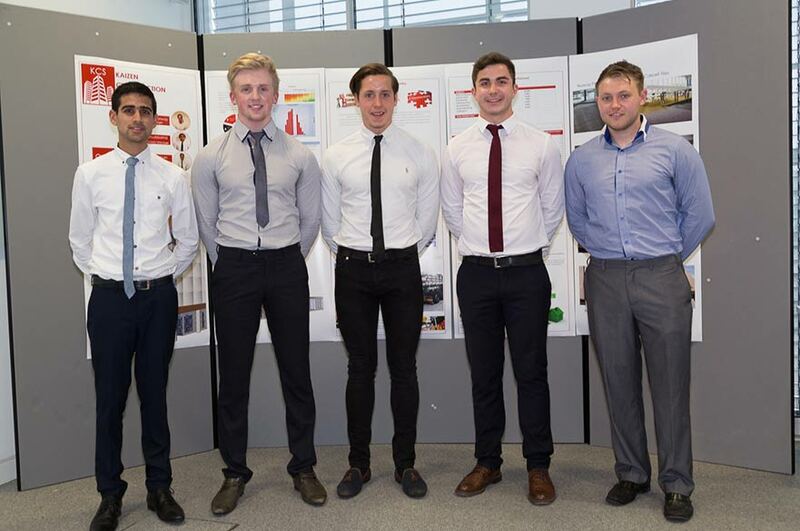 Final year BSc (Hons) Construction Management students have recently worked with Willmott Dixon on a live construction project, giving students first-hand experience of pitching a tender to a leading member of industry. Final year BSc (Hons) Construction Management students have recently worked with Willmott Dixon on a live construction project, giving students first-hand experience of pitching a tender to a leading member of industry. The project teams had to explain how their hypothetical companies were capable of constructing a new concrete frame for a pharmaceutical building for Nottingham Biosciences. The project was split into five separate sections of assessment. To begin, the teams had to produce a short 15-20 minute presentation to explain their company's corporate identity. This was followed by a series of five progress monitor meetings with Willmott Dixon at various stages of the project as it developed both logistically and during construction. Throughout the project students went on a number of visits to the site to see the various stages of construction. During the site visits students also got the opportunity to meet the building services manager of the site who spoke about all the service input and output of the entire build. The teams then completed a tender report where students had to prepare and submit a professionally presented and bounded tender report to accompany their presentation. The next task required students to prepare a construction programme through PowerProject Enterprise Software which was followed by a Primaveva Risk Analysis. Finally, the whole project together presented their tender submission to a panel of judges including representatives from Willmott Dixon. During the final presentation, students were required to pitch their proposal to a panel including David Reid of a representative from Willmott Dixon, and NTU's Construction Management lecturer Graham Dickens. They had 50 minutes to present and were able to use visual aids in conjunction with their presentation. At the end, the panel asked in depth questions to find more specific details where students had to effectively apply their knowledge to a real-world application. Once all the presentations were over a winner was chosen by the panel and received professional recognition from Willmott Dixon for producing industry-standard work. The winning team was 'Kaizen', containing Wesley Barlow, Lewis Blackburn, Anish Chudasama, Matthew Cooper and Thomas McConway. Winning student Wesley Barlow said afterwards: "The most interesting aspect of the project was visiting the real life construction works at various stages. As we had to know the project inside out, in particular the strategy how the project is constructed, then it really did put the information into a real perspective when visiting. It also gave us a chance to listen to professionals working on the job and ask any questions, putting their knowledge into our work and overall learning the techniques to take into a career." "As we had to create a name of a fictitious company based in the UK due to copyright laws, we searched a few key words we all thought which have some meaning and could be used when discovered 'Kaizen'. Kaizen is a Japanese word which has the meaning 'continuous improvement' which proved to be key when presenting the company at what was effectively a sales pitch." "The whole project was very practical as there are a vast amount of skills that I have gained throughout the course." Matthew Cooper said afterwards. "On a general scale, working within a team and enhancing my presentation skills have been greatly improved. In the context of construction, skills like understanding the construction process, planning projects, and generally managing all aspects of a successful construction project have been learnt."